Northbound Magazine Issue 5, which came out during the summer, is now available online! Sorry this took a while since things have been really hectic. In this issue, we featured nine adventure destinations in North Philippines including sandboarding in Ilocos Norte, kayaking and spelunking in Cagayan, surfing in La Union, island hopping in Pangasinan, trekking in Tarlac and Pampanga, horseback riding in Clark, off-road go-karting in Benguet, and zip-lining in Subic Bay. 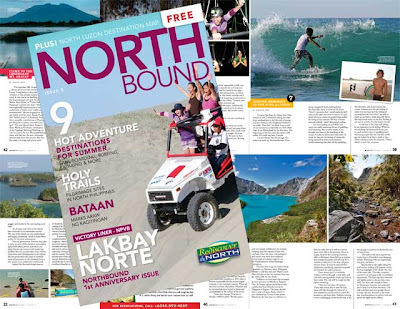 Northbound Magazine is a publication of the North Philippines Visitors Bureau. You can download the online version from the NPVB website.